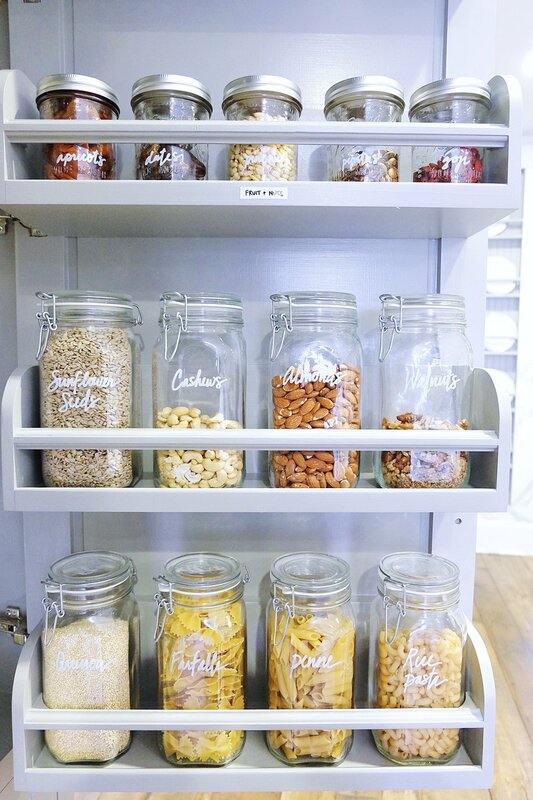 When Gwyneth asked us to organize her pantry…. we were like, WE’LL BE RIGHT OVER. Our main goals were to 1) better utilize the door space, 2) group the most used categories into easy to access bins, and 3) use the top shelves for back stock items and lesser utilized canned goods. We used are a combination of the Large Montauk Basket in gray, and the Rectangular Montauk Kitchen Bins in gray. For the canned goods, we used Stacking Open Bins to take advantage of the height of each shelf. We opted for the Clear Divided Lazy Susan to hold all the oils and vinegars. The divisions allowed us to easily separate the different varieties, and the tall sides of the turntable kept all the bottles secure on the high shelf. 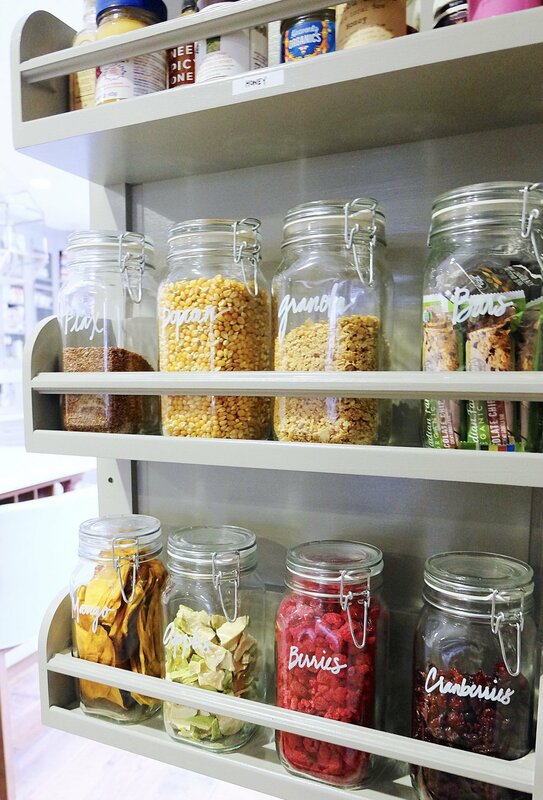 To hold all the staples (dried fruit, nuts, and grains), we used 1.6 qt Hermetic Glass Storage Jars. For the smaller groupings, we used Canning Jars since the contents didn’t take up as much space. We are known for our labeling, so we wanted to do a mix of applications for GP. On the baskets, we used White Bin Clips and black ink in our signature script. For all the jars, we opted for a white paint pen directly on the glass. 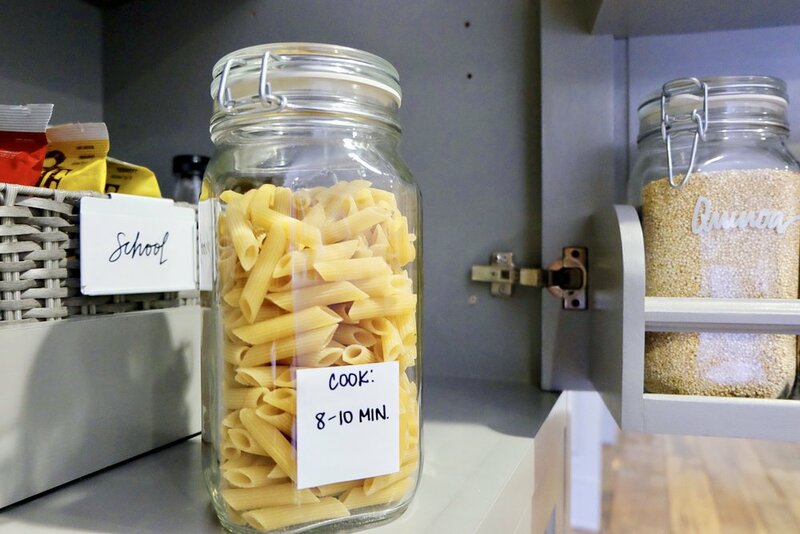 To make notes on cook times or expiration dates, we used Dry Erase Labels that can be easily updated or removed over time. For a full list of our organizing tips and tricks, check out the full feature in goop! Love it! Can you share the dimensions of the closet? How wide is it? Thank you!!! Love the book. Please tackle the garage.